Congress should repeal the law that protects the gun industry from lawsuits. Congress should repeal the bad law that shields them from liability. 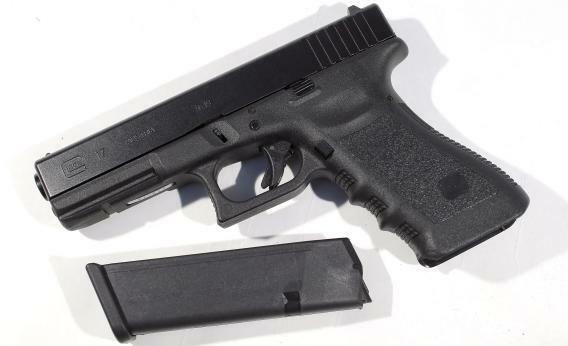 A Glock pistol similiar to the one used by Adam Lanza. The gun manufacturer faced a lawsuit in 2003 until Congress passed the Protection of Lawful Commerce in Arms Act. Photo illustration by Joe Raedle/Getty Images. The horror of Newtown has finally snapped us out of our delusional reverie about guns. Swiftly, a barrage of promising proposals have been thrown on the table: Close the gun-show loophole, which allows guns to be sold to anyone without the simple safeguard of a background check. Ban assault weapons. Ban or control the sale of large ammunition clips. Increase funding for mental health awareness, services, and surveillance. Like any major public health problem, stemming gun violence will require multiple, overlapping strategies. Let me offer another one, overlooked until now, but potentially a dynamo: Repeal the little-known, but pernicious, Protection of Lawful Commerce in Arms Act. In other words, reopen the door to lawsuits against gun sellers for wrongful conduct in the design and marketing of their weapons. In 2005, at a high point of the NRA’s control of the national agenda on guns, Congress passed this breathtakingly broad and virtually unprecedented law. Overriding states’ power to regulate harmful conduct within their borders, the PLCAA eliminated most tort claims anyone might bring against the manufacturers and other sellers of guns, and did so for past and well as future misconduct. Until that point, with my colleague Jean Eggen at Widener University School of Law, I’d been developing an argument that, under certain limited conditions, people injured by gun violence, and cities bearing the financial cost of that violence, should be able to sue sellers. David Kairys at Temple Law School was making similar arguments. And courts had started to see things our way. In one prominent California case in 2003, Ileto v. Glock Inc., an appellate court allowed a negligence claim against several gun manufacturers, distributors, and dealers. The claim was that they’d been part of the chain of gun distribution that led to the deaths of a postal worker and injuries to three young kids in a 1999 shooting spree. The killer was carrying at least seven firearms, all bought illegally. The suit argued that Glock and the other defendants intentionally placed into the market more firearms than could reasonably be sold legally, and that these strategies created a substantial risk that the guns would fall into the hands of criminals. But then the PLCAA came into effect, and the judge had no choice but to throw the case out. Around the same time in the late 1990s, a bunch of cities—including Atlanta, Boston, Chicago, and Gary, Ind.—hit hard by the human and financial cost of gun violence, brought suits against prominent gun manufacturers, including Smith & Wesson, Baretta U.S.A., and Glock. The suits generally alleged that the defendants’ illegal marketing and misleading advertising of their guns had caused the city to spend substantial money on crime fighting, depleting resources. The Chicago case was filed after a sting operation revealed that many retailers were engaging in all manner of illegal sales, multiplying the risk of deadly outcomes. When a state or city can convince a court that an activity threatens the safety of its citizens, it can require the nuisance-causer, like a toxic waste dumper, to stop, and to pay for the cost of clean-up. The cities argued that the gun sellers were creating a nuisance. And some of these lawsuits—notably, those brought by Gary and Cincinnati—successfully advanced through the courts. But the PLCAA stopped them cold, too. To be fair, these cases faced difficulties before the PLCAA. Suits like Ileto, based on bad marketing and advertising practices, are controversial, in part because it’s hard to prove that the marketing led to a particular injury. And while the cities’ claims show the power of public nuisance theory, they also suggested that cities could effectively regulate guns right out of the market. But the law evolves by testing theories, discarding some and ultimately embracing others. And until the NRA got Congress to choke off these suits, no industry got a free pass on the whole litigation process. Even with vaccines—where untrameled access clearly benefits the public—drug manufacturers got only a partial shield: If you can show you’re injured by a vaccine, you win compensation from a federal fund (paid for by a small excise tax on each dose of vaccine). People who are injured or killed by guns, or cities saddled with the financial costs that gun violence causes, by contrast, are without recourse. We should care about preserving the right to sue not only for those who are injured or killed, but because litigation is a useful supplement to regulation. Especially for guns, given that regulation is anemic in the first place. Often, defendants will change their behavior—self-regulate, in other words—rather than risk liability. Faced with the public nuisance suits, Smith & Wesson agreed to limit retail customers to no more than one gun within a two-week period and threatened dealers with cancellation of their contracts if “a disproportionate number” of crimes were committed with guns they sold. S&W also began installing safely locks on its weapons. That last bit is particularly important because the Consumer Product Safety Commission is forbidden from regulating firearms. A spokesman for the NRA hailed the enactment of the PLCAA as “an historic day for freedom.” But a different definition of freedom is ascendant in the wake of Newtown: freedom from fear of rapid-fire weapons. It’s time to end Congressional cosseting of the gun industry. Repealing this bad law would be a valuable piece of the puzzle we must begin to put together.